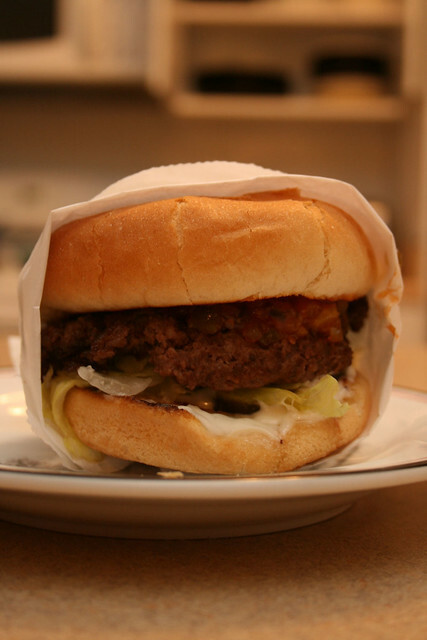 Apple Pan is an institution in Los Angeles; the legendary burger joint has been offering its exclusive menu for years as part of their strict adherence to keeping things simple and never changing. Something new to me was that they offered burgers to go. I opted for the take-out menu last Friday night to pair with a few wines over dinner with a friend after work. 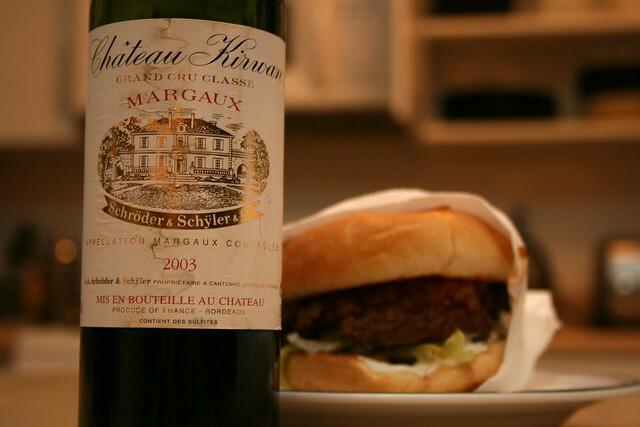 When my friend arrived with a split (375ml bottle) of 2003 Château Kirwan (#177) in hand, I had been upstaged by vintage and value, after pulling my random 2005 La Bastide Blanche Bandol (#176) for the purposes of burgering. I scrambled to find something more interesting but he said it didn’t matter and he was more curious about judging where his wine was in terms of readiness to drink. We uncorked both bottles, encouraging both to open up while we went out to Apple Pan to pay too much for two burgers. We stepped foot in the perennially busy restaurant about five minutes later, timing the ebb and flow of eaters just right, managing to squeeze in and order “Two steak burgers” one with cheese and the other without for an exorbitant total of fifteen dollars without waiting. Yikes, fifteen dollars for two simple burgers! We waited a few minutes, watching our burgers be created and in a short time we were handed our white paper bag and were off to my residence to check up on the wine. Unwrapping the tiny packages and staging the photo shoot, with the wines in perfect position—even the half bottle was dwarfing the burger—we took the shot before we ate. My buddy spied too much mayo for his liking and asked for the knife to begin a scrape. It might have had something to do with the putty knife the chef used to administer the mayonnaise or the simple fact that all the condiments were excessive, including the cloyingly sweet relish. It was unnerving to see the amount of mayo that my friend removed from his hamburger but after that we kind of looked past the faults and started eating because… at least we had the wines. The Bandol was stunted on the nose, reminiscent of a newly opened package of photocopy paper—it was fair to say that it was slightly corked—but still drinkable. On the palate it wore less of that funk, showcasing earth and savory qualities that meshed incredibly well with the burger. Later, the nose would open up, presenting some interesting fruit notes tied into anise that had been obscured earlier in the tasting. An interesting experience to see a wine work to shake off its funk, but that is exactly what happened and, so, I will reserve my final judgment of Bandol for the Domaine Tempier Bandol later in the year. We had two glasses each, to keep each presentation clean and undisturbed for each wine poured. 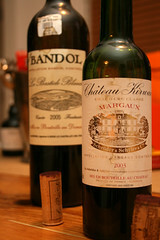 We transferred the contents of the Bordeaux from Margaux into the second glass. 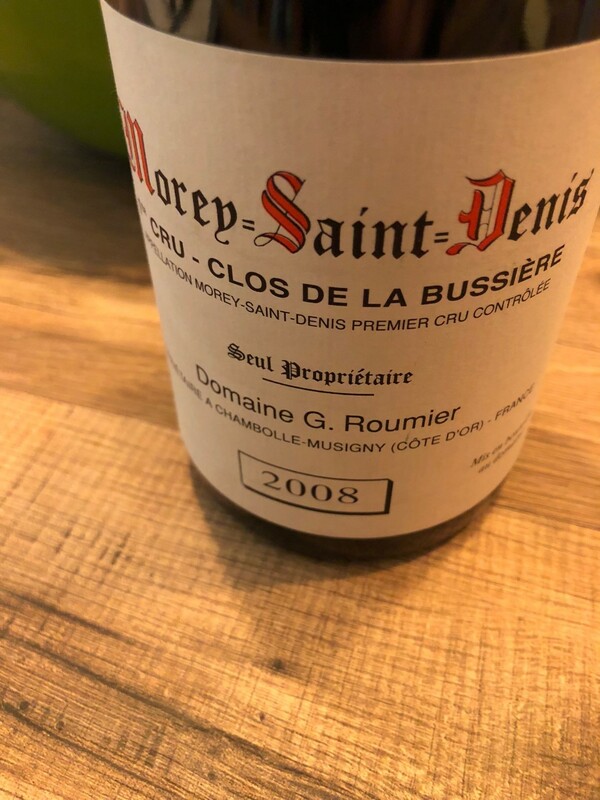 With notes of blackberry, cassis and some leather highlights that were readily detected as we swirled the glass and on the palate, the wine was drinking well, showing polished tannins that massaged the tongue and some lengthy notes of fruit and dried herbs (thyme) that stayed with me on the finish. It paired well with the burger but was much more enjoyable on its own. The sweet relish was not as forgiving to the Bordeaux. I was really disappointed by the price of the Apple Pan burger. 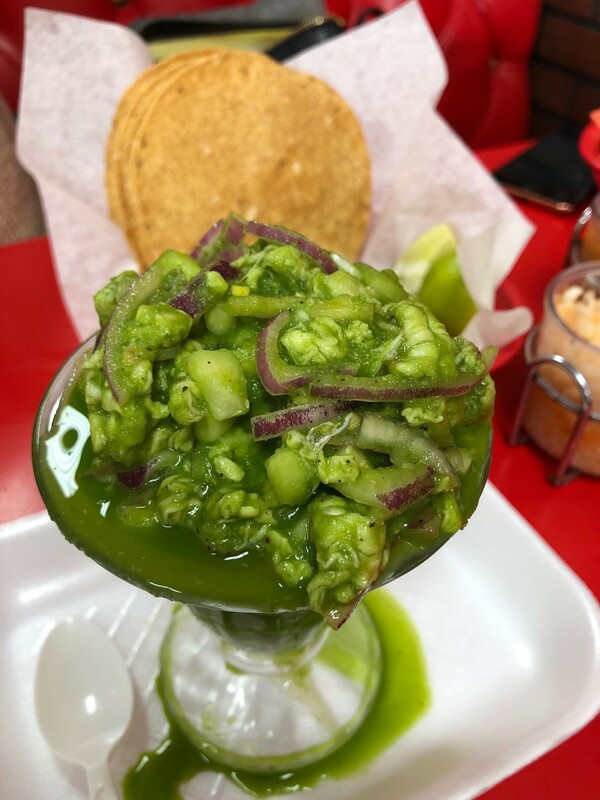 If not for that, I could see myself eating there again, but, in reality, I can only see myself acting as the host offering guide tips to out-of-towners, shepherding someone else there for their first time. The wines, especially the Bordeaux over-delivered on their end; the Bandol could have done with less controversy (partially blighted) but it was still a solid pairing with the burger. I was astonished by the quality of the 2003 Bordeaux still showing some character and having a backbone in a hot vintage even if the food accompaniment was less than stellar—I am just going to have to change the location of the eatery in the future to match the caliber of the wines. Easier said than done!